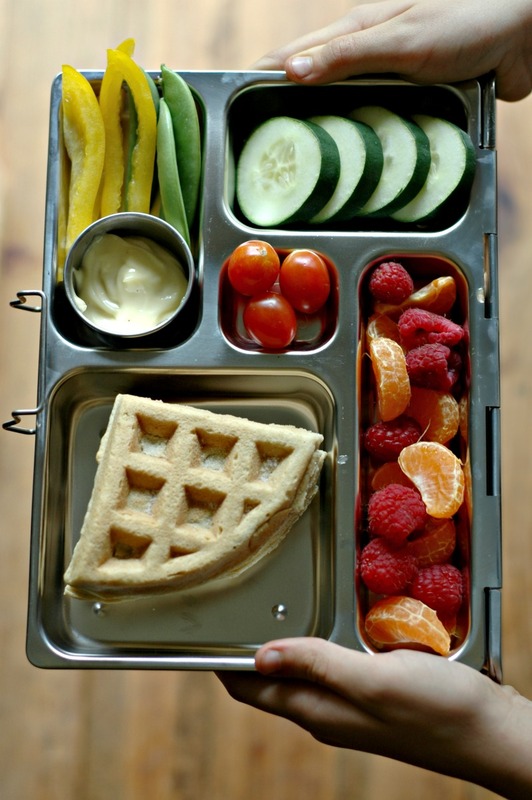 Pack school lunches full of veggie variety with the greatest of ease, and learn how to avoid lunchbox burn-out! If there is anything I have learned 3 kids into this school thing, it’s that lunchbox burnout is totally a thing. We are exactly 2 months into school, and I am already getting messages, emails, and questions about how to get into a school lunch rhythm, how to get variety into lunchboxes, and why, oh why do we have to do this 5 days a week?! You guys, I completely get it. I have been there. 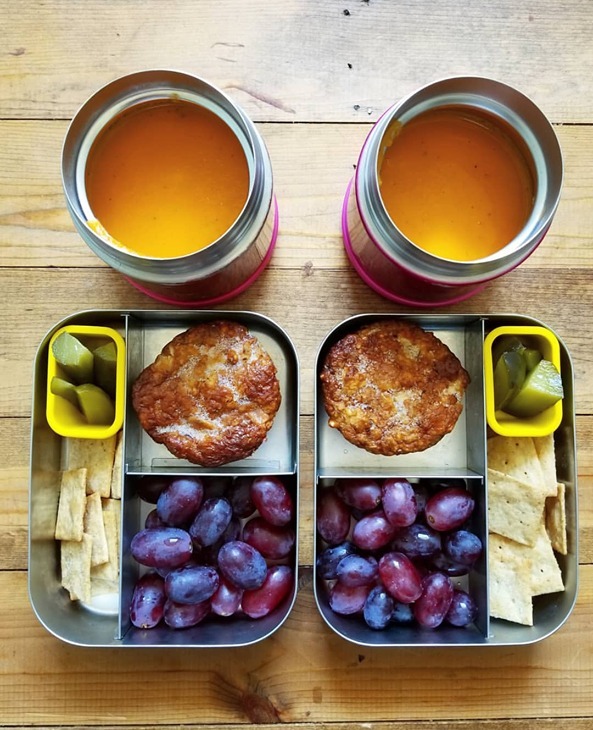 Yep, the food blogger that literally makes her living off of blogging about feeding kids healthy and Instagram’s daily school lunch posts (#rgnschoollunch) has struggled with school lunch packing burnout. Because there really is a human, normal, everyday mom behind this screen, and it is completely normal to feel the burnout. <—- Please read that part again. Don’t give up on it all and beat yourself up, because lunchbox burnout is a very real thing, and I can’t wait to give you some seasoned momma tips on how to avoid it for as long as possible. I recently recorded a podcast with my friend Kristin from Live Simply. At the beginning of the interview, I remember telling Kristin how google eyed I always am at her meal planning posts, because I have simply “never been a meal planner.” As it turns out, we discovered that there is definitely a “framework” to how meals flow at my house – it just might not all be down on paper in a pretty planner. I really do think that having this rhythm and flow to how I pack school lunches is how I have been able to avoid the burnout. A framework takes the thinking out of packing – you just follow the pattern! What exactly is a framework? I love the idea of calling this meal planning style a framework because it leaves plenty of wiggle room for variety. And that matters for multiple reasons. Not only does variety help save your budget by allowing you to buy whatever produce is in season and on sale depending on the time of year, variety also allows us to get a good diversity of nutrients into our ever-growing kids’ bodies. So for instance, if you follow my #rgnschoollunch tag over on Instagram, you’ll notice a rhythm to Monday’s. I almost always use leftover GF waffles from weekend breakfast to make sandwiches, and then the fruit and vegetable are constantly changing. Seriously momma, it is that simple. Don’t complicate this thing – it is one of my secrets to NOT burning out. So that veggie might be a salad, or veggie sticks with dip, or whatever roasted veggies were left-over from dinner that night – there is so much wiggle room depending on what vegetables are in season and on sale. I’m all about baby steps, so let’s take this one thing at a time. Since all things vegetable is one of the most commonly asked about lunchbox questions I get, I thought we could focus on that. How do we get the variety in and how much do I pack? 4 School Lunches With Veggie Variety! THIS, dear momma, is seriously where it’s at. Cook once, eat twice. Dinner leftovers aren’t just for the main meal or thermoses like spaghetti. You are absolutely allowed to take your kiddo’s regular PBJ lunch and add dinner veggie sides to it! Kids LOVE roasted veggies – and who wouldn’t?! Roasting vegetables brings out their sweetness, and it is so easy to eat. Veggie “mashes” also work so great. Sweet potatoes and regular potatoes are only the tipping point! You can get squash mashes in there or even roasted root veggie mashes blended with carrots, potatoes, and a little green. Veteran Momma Tip #1 :: YES, my kids eat this stuff cold. If your kiddo won’t have anything to do with that, you might need to use a thermos. If you happen to be reading this post, and you have younger children (babies and toddlers), I encourage you to start NOW. 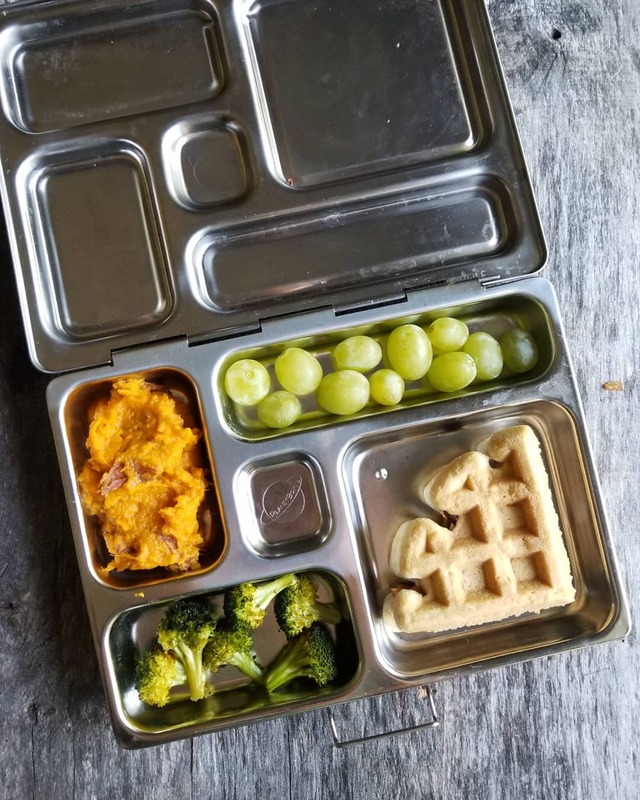 Train their palates to be cool with leftovers at room temp, and I promise the lunchbox packing years will be so much easier. 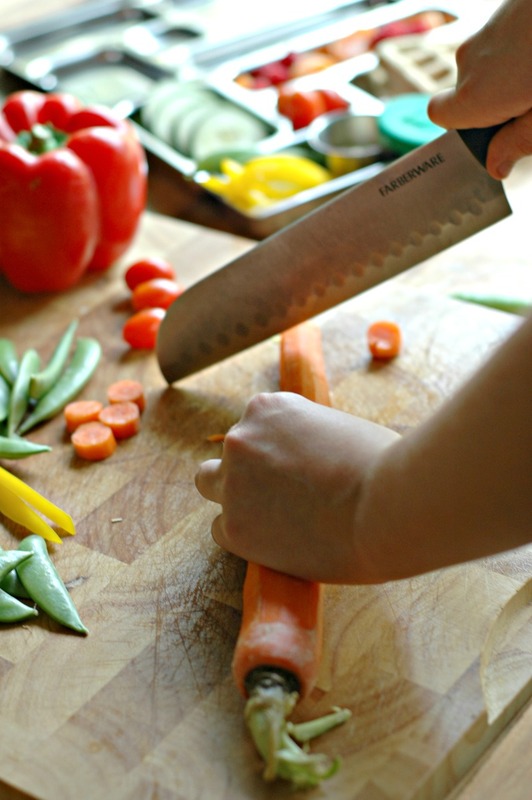 Veteran Momma Tip #2 :: Make more veggies than what you really need for dinner to ensure you have those leftovers. 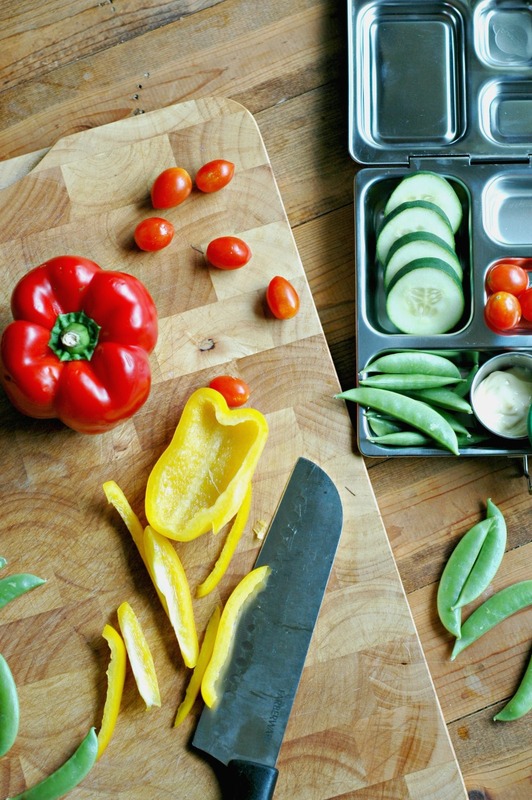 If you usually make one sheet tray of veg, make 2! You already have the oven on anyway, you might as well work ahead. 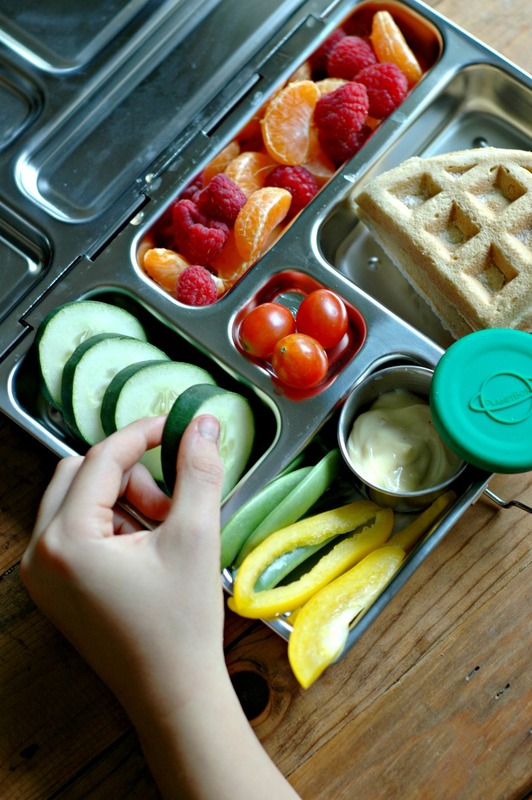 You can fill up lunchboxes, and also use the leftover veg for your own breakfasts or lunches. There is so much you can do to change up a salad. 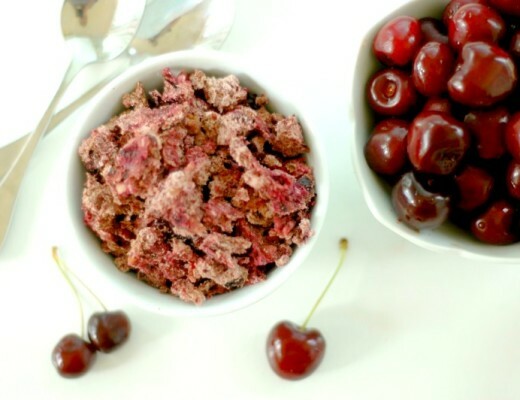 The veggie toppings can change weekly, and you can add in extras like crush nuts or seeds, dried fruit, cheese, or hard boiled eggs to make them fun and interesting. Veteran Momma Tip :: Because younger children typically take a longer time to manage eating a salad, it is important to realize that salads are sometimes better suited for kiddos past Kindergarten/1st grade. In these cases, just “de-construct” the salad. Put the different components of the salad in to the lunchbox and add some dip. Not having to manage a fork to work at a salad helps with time management, because at school they don’t necessarily have an hour to eat. 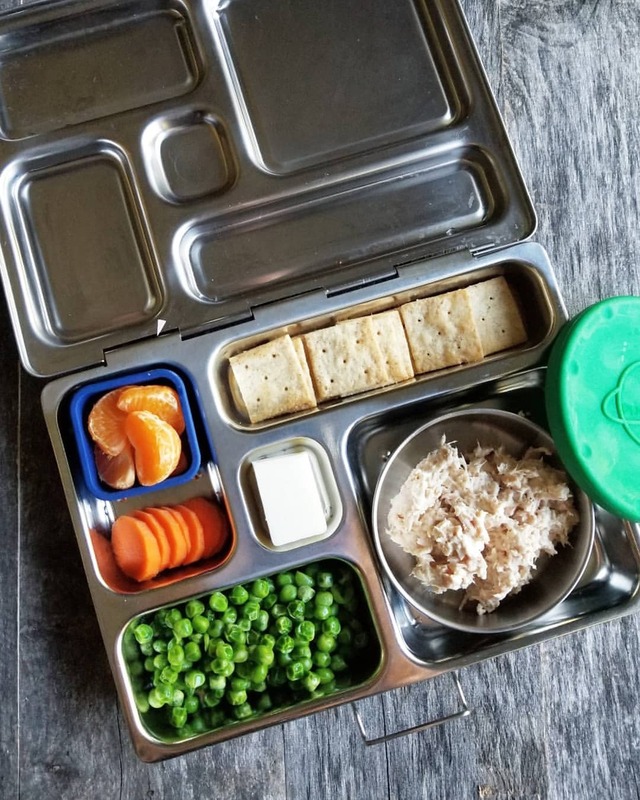 Leave the salad eating practice for dinner time at home for your little guys, and just make it easier to eat in their lunchbox. Veteran Momma Tip #2 :: You do not (I repeat, you do NOT) need to go overboard making veggies into fancy shapes and patterns (unless that is your thing of course!). 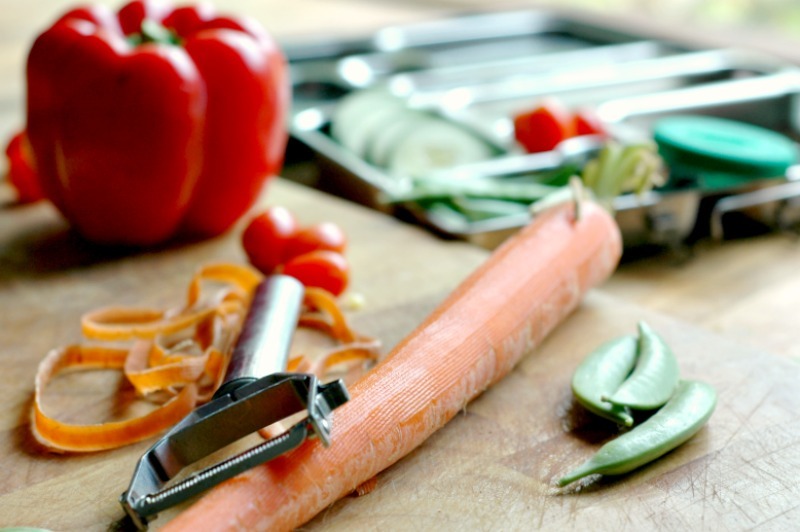 But you CAN make the veggies more interesting and even more easy to eat by using things like a julienne peeler to make strips of carrot versus sticks. They are easier to eat that way for some kids. Or, cut disks/coins of carrots and cucumbers for easy dip scooping. Peas and little mixed frozen veggie bags from the freezer section, dear momma! They are a finger food snacktime lifesaver as babies and toddlers, and they are a lunchbox lifesaver for school aged kids! I get the big bags of frozen organic peas and mixed veggies at Costco. You can put them in frozen and they thaw by lunchtime! Veteran Momma Tip :: If your kids prefer some butter/seasoning on their veggies, simply warm them up in a pan real quick to coat them with butter and sea salt and then pack them in. One of my girls prefers them this way, so I take the extra minute to do that and lunchboxes come home empty. The extra fat consumption and minerals from the sea salt is a bonus too! Because seriously how fun is that?! You can make a fry out of lots of different kinds of veggies – white potatoes, sweet potatoes, butternut squash, yucca, carrots, parsnips…the list is endless! 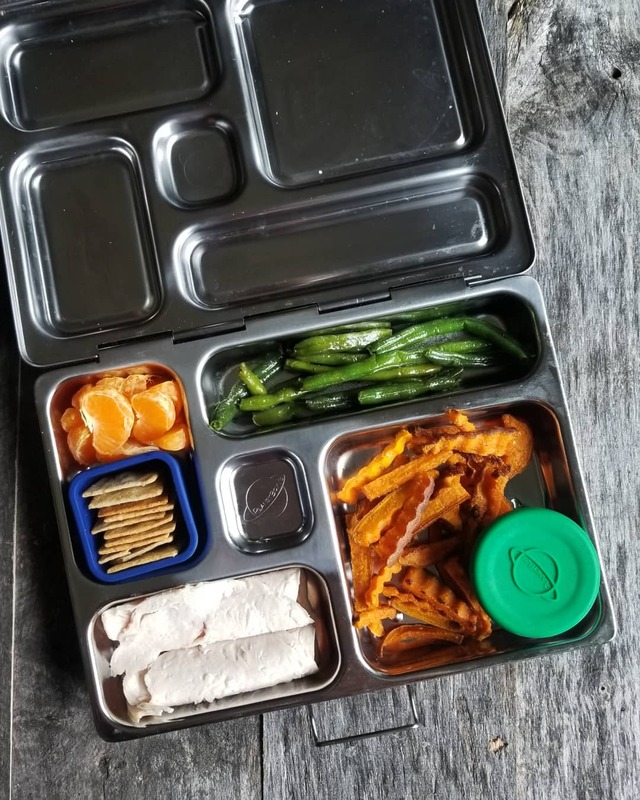 Veteran Momma Tip #1 :: Make a sheet tray of fries to go with dinner, and while you are at it just add in a second sheet tray so you have enough for lunchboxes. Cook once, eat twice. Veteran Momma Tip #2 :: There is something about crinkle cut fries that literally make kids think they hit the jackpot! Just get a little crinkle cutter and watch how fast the veggie fries go! Veteran Momma Tip #3 :: A little ketchup never hurt anyone 😉 If it means they will get the veggie fries in, I say go for it. My kids don’t necessarily need it, but I do like to play the fun mom every once and a while and pack some ketchup along. 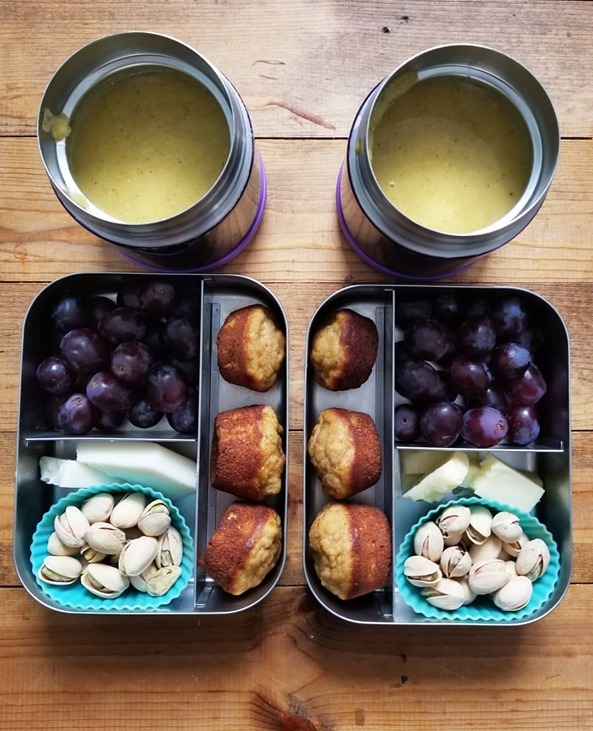 Originally, this post was supposed to be cold lunch/bento box style lunch focused, because I know not everyone uses thermoses. I just couldn’t leave this idea out though. One of the ways I really love packing the veggies into kids is using soup. Soup purees to be exact. The added bone broth is extra protein and nourishment – it’s truly win-win. THIS is the thermos I’m using! Veteran Momma Tip #1 :: Stainless steel straws are your friend! The make the soup less messy, faster to eat, and much easier to eat, so the kids are more likely to get it all down. Veteran Momma Tip #2 :: Cook once, eat multiple times. I’m starting to sound like a broken record, but utilize this! Make a big pot of broccoli soup, squash soup, or tomato soup for dinner, and then scoop the leftovers into thermoses for lunch the next day. How many veggies should I pack? If your child is not really into veggies, focus on veggie eating at breakfast and dinner at home. 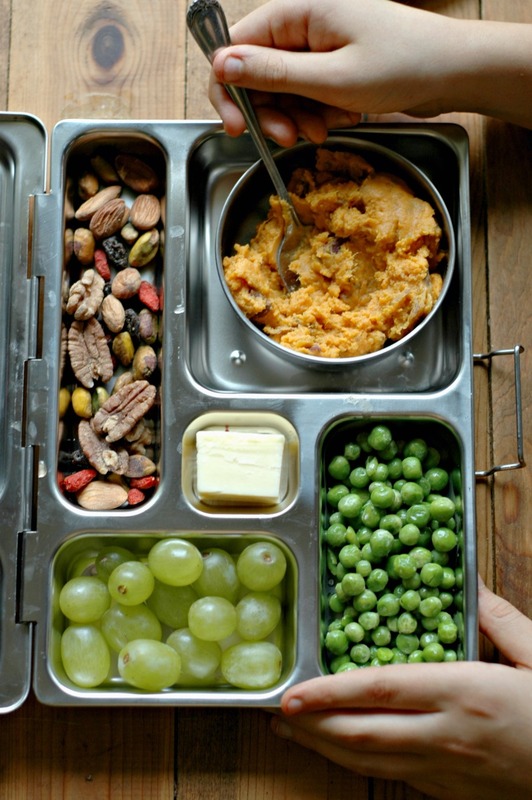 You want your child to be full and focused at school, and if you pack it full of veg they probably won’t eat, you are risking them going all afternoon without fuel. If you have a younger child (1st grade and under I would say), consider how long raw veggies take for your child to eat. Specifically salads which take some coordination with a fork and extra time to chew, sometimes these veggie meals are best kept for dinner time at home to practice. Roasted/steamed veg or just veggie sticks are easier to manage for little guys. Another thought on the very little guys that are in their first or second year of school. Their brains are literally on overload. A school day is a lot to take in. If they have never eaten at a daycare as a baby/toddler, eating at school with a bunch of their peers is so different. It is exciting! And they are going to be slower to eat. 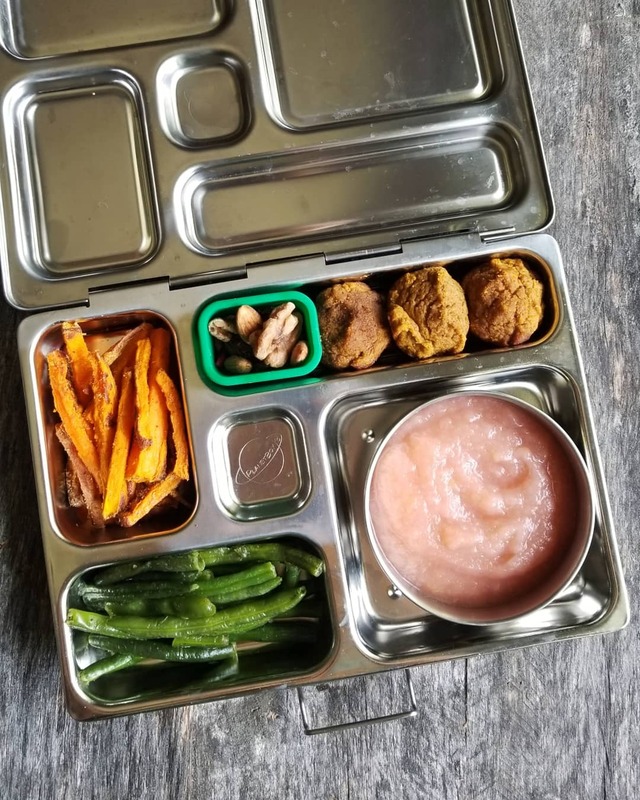 The star of their lunch should not be veggies – make sure there are enough filling items in their lunchbox so they can fill up as much as possible before their afternoon begins. Consider the time your school allows the children to eat. Unfortunately, the 25ish minutes my girls have to eat is probably not the norm – I hear of schools that only allow 15 minutes. Consider this, and save larger portions of veggies for dinner time – you want to make sure what they do have time to eat is going to fuel them for their afternoon. We’ve been using our Planetbox’s since my 4th grader was in Kindergarten! They still look like brand new, and they are so easy to pack and wash up. Make sure to check out the accessories tab for the “Pods” that you can use to separate compartments, the leakproof “Dippers” for their condiments (each Planetbox comes with one of these), and the leakproof bowls for drippy food (each Planetbox comes with one of these). Also pictured in the “bonus” number 5 lunch idea is the gear I use for soup days. It all fits right into the Planetbox bag too. I use the Lunchbots brand 8oz thermos and have the Trio and Duo Lunchbots trays. Salad Dressing & Veggie Dip Recipes for all those veggies! Hey, listen, if the vitamins in our veggies are “fat soluble,” we might as well pair them with delicious fat based dips to allow those vitamins to absorb. Let the kids pick what they love and dip away! Get my Thousand Island, French, Italian, & Fiesta Dressings here! Olive Garden Copycat – SO good! 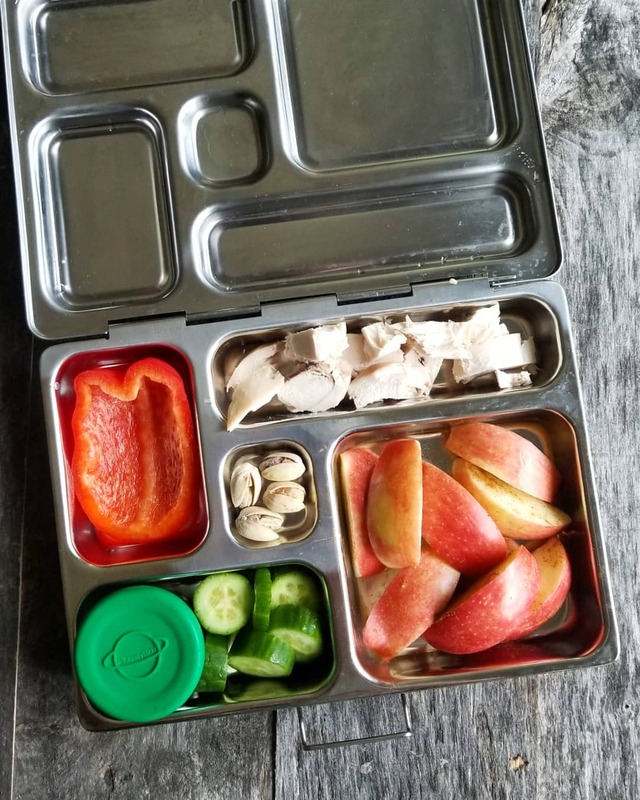 If you are a paper and pen sort of a person, you MUST check out Kristin’s Simplified School Lunch Kit over on her blog – absolutely invaluable for new school lunch packers and visual learners! Here is my Lunch Gear Resource Guide if you want to learn more about the lunch gear I use and why. Here is Part 1, Part 2, and Part 3 of the real food podcast recorded with Live Simply – there are so many tips and real life examples from my own home menu, including lunchboxes. Tiny Love sat here with me and looked at every single picture saying “oooh that looks good” “oh that looks yummy” “oh I love peas” “those mandarins and raspberries look yummy” – so fun! Love all of this variety and all of the veggie and fruit options. I don’t have to pack lunches, but I still get lunch burn out even homeschooling. Thanks for the ideas! Thank you for giving me permission to feel burned out! Your lunches, as always, are an inspiration and a true help! Omg these are so fun! I shared with my sister who has a daughter. If I still had a 9-5 I would make these for myself to take to the office! Great tips Rene! I am out of this phase of life but remember it well. The burn out is real! So many great tips and ideas! Thanks so much as I will use it for my own lunchboxes now too. Yes! Burnout happens to the best of us. These are some great tips to combat it. 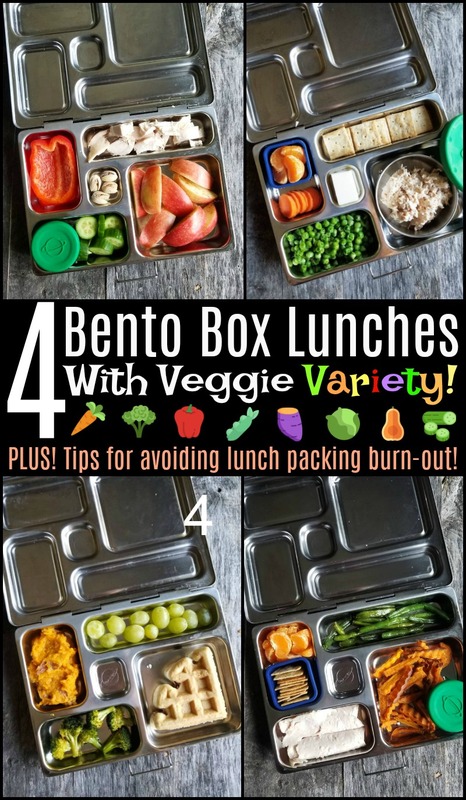 Love that term lunchbox burnout – so true haha! Deconstructed salads are my go to (among other things and leftover roasted veggies)but it is certainly hard to keep the variety up!Some great tips here – looks like your kids have some pretty tasty and healthy lunches! Fabulous info-packed post! So many of these ideas are applicable to those of us.. who need to pack lunches for any of our family members, big n’ small! Love the containers too. I need to learn how to meal plan more effectively and I like the idea “framework” great word! Wow, you make the best, most creative lunches! 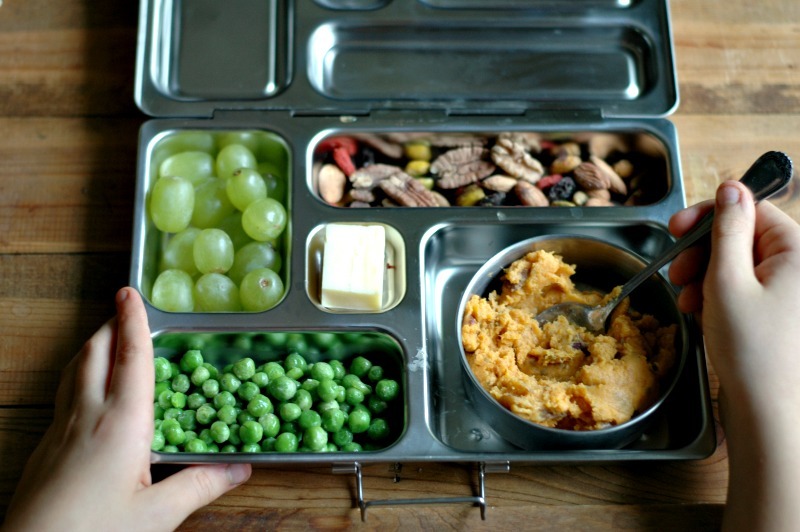 I love the lunch boxes with tray insert you use. I’m certain my son is so bored with the lunches I make over and over again. These boxes are so adorable! 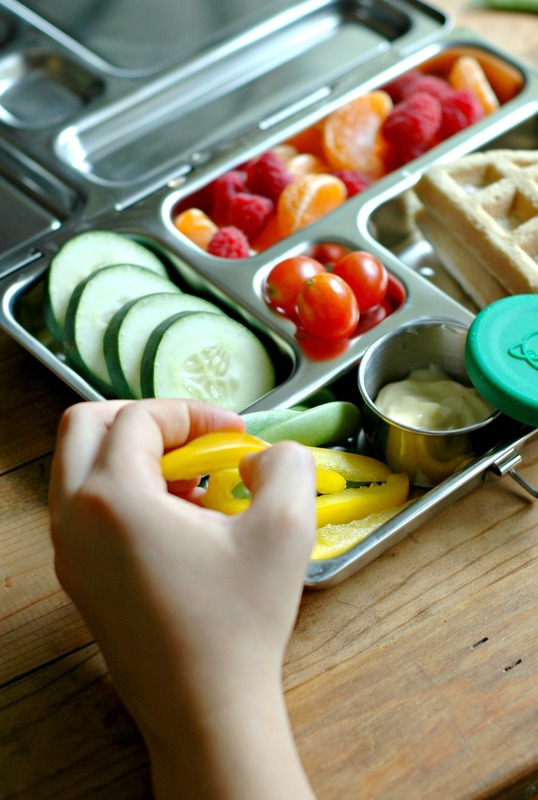 I love seeing how you educate your kids to make lunch and participate in the process. Just fabulous! Uhhh, can you pack my lunchbox please! I love all the colors and variety! We love reheating leftover soup and packing it in thermoses for school lunch. I didn’t realize but you’re absolutely right, even meal plan haters have a sort of “framework” that guides their meals. 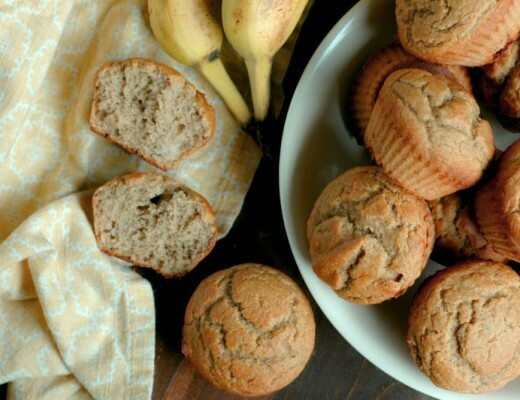 These are great ideas for lunch! It always helps when your meals are planned out. 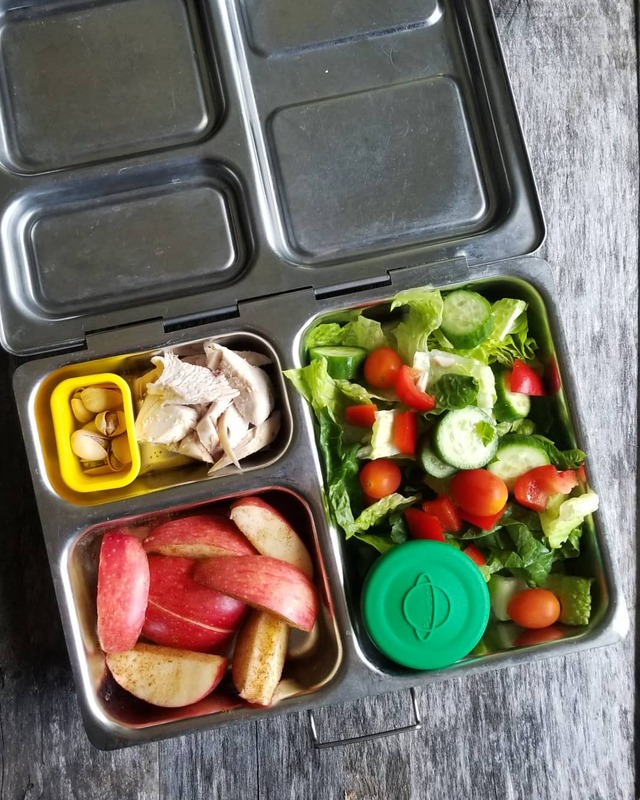 What great ideas, and I love the tips as well since I pack my husband a lunch every day and sometimes feel like I could use some extra inspiration! 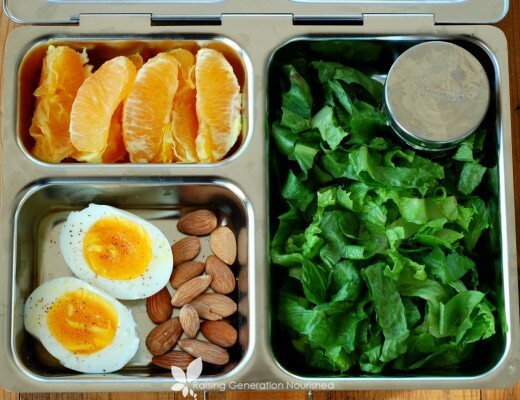 This is such a great way to pack a healthy lunch. I love it. You provided so many great choices. Boy did I ever need to read this. Not even halfway through the year and I am already burned out – lol. Great ideas here! I’m glad it was helpful Katie!